Gaslighting is highly destructive behavior that impacts most loved ones of gambling addicts. While you may never have heard of this term, once you understand what it is, it's highly likely that you'll recognize that you've been a victim. It's actually a form of emotional and psychological abuse that involves the addict presenting false information, half truths, or outright lies. For the most part they tend not to be outrageous, but actually quite believable. Also, it's important to note that the loved one (typically the spouse) really wants to believe the stories they're being told. We love them, and truly don't want to believe that our spouse would lie and deceive us, so we're abnormally receptive to being convinced. 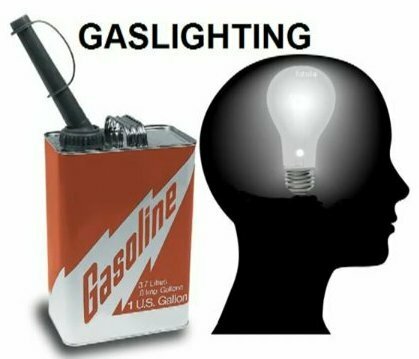 But gaslighting is more than being lied to or deceived. They make us doubt ourselves, and our own perception of reality. They may even literally tell us that we're so mistaken that we should seek counseling because our perception is off! Over time we end up doubting our perceptions, our memories, our overall judgment, and even our own sanity. Keep in mind that this happens even to those of us who are overall very competent and emotionally stable people. Had I read about this before it ever happening to me, there's no way that I would ever think it could happen to me. I'm far from perfect when it comes to remembering things, and I know my perception can differ from what reality actually is; however, I'm pretty damn emotionally stable, and good and keeping things in my environment in perspective. That said, the emotional abuse is a gradual such that you don't see coming until it hits you. I read an interesting analogy that involves boiling a frog in a pot. The water heats up so slowing that the frog doesn't realize that it's approaching its death until the last second. In that sense, gaslighting is a slow process that can easily happen to the best of us even when we become educated about it. It truly is unbelievable! For me, it got so bad that I literally told myself to take on the default assumption that everything I did, said, and recalled was likely wrong, and to believe everything that I was being told. You can see how dangerous that can become, particularly when dealing with a loved one who is pro-actively deceiving you! Another aspect to keep in mind is that gambling addicts in particular tend to be highly intelligent. These are not dumb people who do dumb things. These are very capable, highly intelligent people, and they use that to support the lies and deception. When you think about it, you really have to be sharp to keep track of the web of lies to remember all the Peters they stole from to pay Paul, and to recall who you told what lies to. Now that you know about gaslighting, you're already light years ahead. This awareness will not prevent it from happening, but will definitely provide a means to help protect yourself, and to start the recovery process. We often don't have a trusted adviser (whether friend or therapist) with whom we can describe in detail what's been going on. That would be a fantastic means of helping to reduce the self doubt by having someone who can tell us that we're recalling correctly, or that our thoughts and actions are natural and logical. Assuming the lack of such support, what I did to help myself was to change my default way of thinking. What I mean by that is that I trained myself to assume that everything I thought and recalled was correct, and that my loved one was mostly likely gaslighting me. I suspended disbelief in myself, and reassured myself that I was not crazy, and that I was being deceived. Doing this doesn't feel natural, for as mature, well-adjusted adults, we know that we're not perfect, and that our perceptions can be wrong, and we can make mistakes remembering things. However, I was so emotionally distraught that I became incapable of deciphering the truth from the subtle lies and manipulations. This swing to the other extreme, where I had to tell myself that I was always right, enabled me to regain my self-control. The degree of my emotional breakdown had led me to have migraines. And to put that in context, I had NEVER previously had a migraine, and rarely even got headaches unless I was very sick. I later learned that the emotional and intellectual stress that I was under was the cause of my migraines. These quickly dissipated once I came to the understanding that I was not crazy! All that said, I truly believe that the only long term solution is to get therapy for yourself. Whether or not the addict in your life gets therapy, comes to understand their addiction, and commits to the recovery process, or whether or not you stay together or part ways, you NEED to get therapy to regain your sanity, as this type of emotional abuse is likely to linger even long after you escape the throws of the addict or relationship.